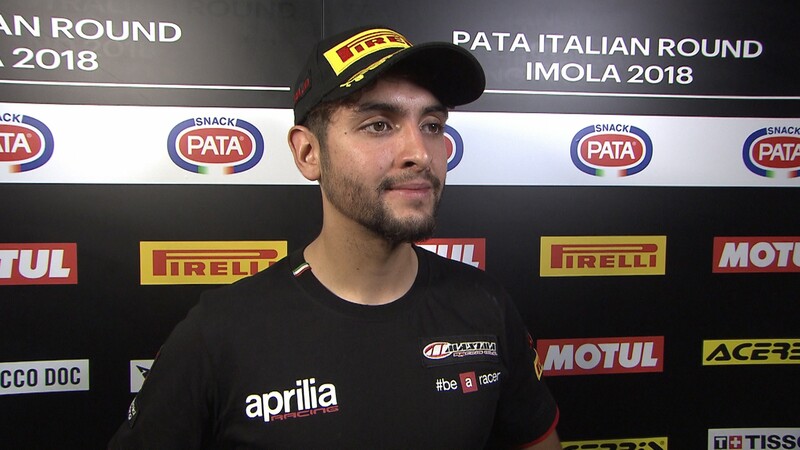 Maximilian Scheib (Aprilia Racing Team) survived the rain and the Italian cavalry to grab the first pole position of the Chilean’s European Superstock 1000 Championship career. Scheib defied the wet conditions to record the fastest lap of the day, under constant pressure from Alessandro Delbianco (GULF Althea BMW Racing Team) and Luca Salvadori (Berclez Racing Team SA), second and third respectively. With the first raindrops falling throughout the WorldSSP Superpole, by the time the STK1000 riders were ready they faced a drenched track, much different from the perfect conditions on Friday. Teams struggled to find the correct set-up, with up to 14 seconds between the times set by the first and last riders. 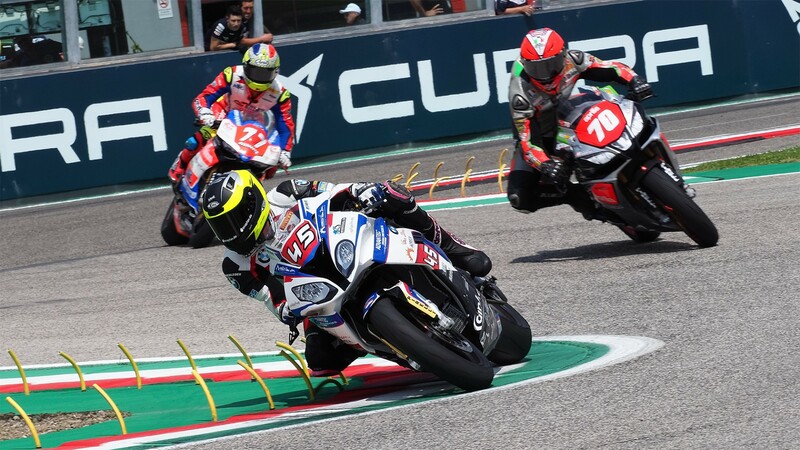 Most of those who did find their feet at the Autodromo Internazionale Enzo e Dino Ferrari di Imola were the local riders, with four Italian riders in the top 5 and six in the top 8. Behind Delbianco and Salvadori, Andrea Mantovani (Nuova M2 Racing) and Emanuele Pusceddu (D.K. Racing) followed, just ahead of Florian Marino (URBIS Yamaha Motoxracing STK Team). Federico Sandi (MOTOCORSA Racing) will lead row three, with the seventh fastest time. 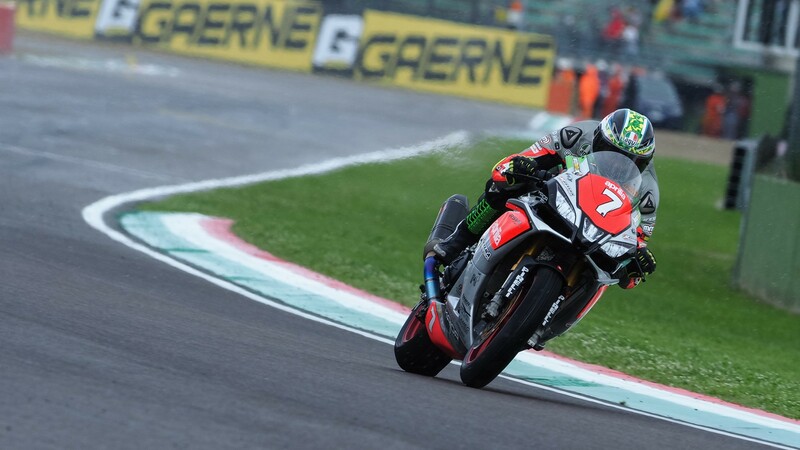 Markus Reiterberger (alpha Racing-Van Zon-BMW), who had been utterly dominant at Aragon and Assen, could not find the pace here at Imola, and will have to fight back from ninth if he wishes to continue his winning streak. Luckily for him, his main title rival at the start of the season, Roberto Tamburini (Berclaz Racing Team SA) fared worse still, with the thirteenth fastest time. The STK1000 race closes Imola weekend tomorrow at 15:15 (13:15 GMT)! Watch the race and all the best highlights from the Pata Italian Round, thanks to the WorldSBK VideoPass.